The shores of Lake Garda (or Benaco), the largest Italian lake, enjoy a temperate microclimate, which is mild enough to allow cultivation of grapes, olives and citrus trees. However, winters are quite cold, though less than in the Po Valley or in the sub-Alpine valleys. Summers are hot and quite sunny, but there are also quite frequent thunderstorms. In fact, because of the thermal contrasts between the mountains and the plain, with the contribution of the lake's humidity, in summer, thunderstorms can break out around Lake Garda, sometimes strong and accompanied by hail and wind gusts. 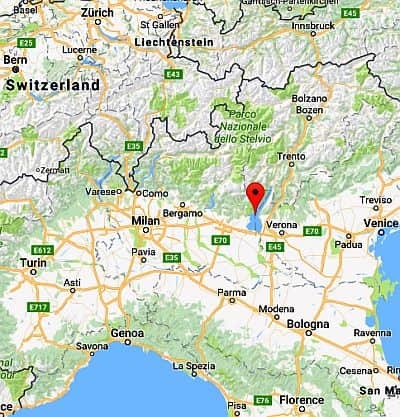 Some towns that are found along the shores of the lake are: on the Lombardy side, Desenzano, Gargnano, Limone del Garda, Salò, Sirmione, Toscolano Maderno, Gardone Riviera; on Veneto's side, Bardolino, Malcesine, Peschiera del Garda, Torri del Benaco; on Trentino's side (in the northern part), Riva del Garda and Torbole sul Garda. Here are the average temperatures of Salò, on the southwest shore of the lake, in the province of Brescia (they are the averages of the 1961/90 period, when the climate was slightly colder than today). The rains in Salò are quite abundant, since they amount to 1,100 millimeters (43 inches) per year. Winter is the (relatively) driest season; in spring and autumn, the rains are due to Atlantic depressions, while in late spring and summer, as mentioned, thunderstorms in the afternoon and evening are quite frequent (and sometimes intense). Winter in lake Garda, from December to February, is pretty cold, but it's less cold than in the Po valley because of the warming influence of the lake. Fog too is less frequent. There is a moderate amount of rainy days, even though the winter is relatively dry compared with the other seasons. Snow is not very frequent: a snowfall can be seen at least once every year, even though it's almost never abundant (except in the northernmost tip, in the area of Riva del Garda, where snow is a bit more frequent and sometimes there may be accumulations of some importance). We can not exclude cold periods, with night frosts (usually light) and temperatures around 0 °C (32 °F) in the daytime. Summer, from June to August, is hot, and often sunny, especially in the morning. The heat is less intense than in the Po Valley, in addition there's more wind because of the lake breeze. Sometimes an Atlantic disturbance able to bring some cool and rainy days can affect this area; more often, thunderstorms can break out in the afternoon or in the evening. We can not exclude some very hot days, with highs around 35 °C (95 °F). During the warm half of the year, in the area of Lake Garda the wind is weak or moderate, and follows the breeze regime. The breeze is strong enough to generate waves and is appreciated by fans of surfing and windsurfing, and tends to be more intense in the northern and central part, where the lake is narrower and the wind tends to be channeled. In the warmest hours, at noon and in the afternoon, the breeze blowing from the Po Valley towards the mountains is called Ora, and it's more intense in the northern part of the lake, and weaker in the southern part. On the other hand, after sunset and at night, the Peler, the breeze from the north, blows from the Alps to the plain, reaching its peak in the early morning, from 7 to 9 am, and it's more intense than the Ora, especially in the northern and central part (in particular, on the east coast from Malcesine to Navene, and on the west coast to the north of Limone). There are also some local and transverse winds, such as the Ponal, which blows along the river of the same name, from the Ledro Valley. In winter, the amount of sunshine on Lake Garda is slightly better than in the Po valley; in spring and autumn, when Atlantic fronts pass quite frequently, it is decent but not great; in summer, it is pretty good, although in periods of fine weather, as I said in the afternoon some cloudiness can form, which can also generate thunderstorms. The temperature of Lake Garda is around 20 °C (68 °F) from June to August, so it remains cool to swim in, even though it depends on the area (the southern part is a bit warmer than the northern one) and especially on the period: during the hottest summers, like that of 2015, the temperature of the lake can reach as high as 25/26 °C (77/79 °F). Near Lake Garda are a few smaller lakes, located in a different environment and with a climate much colder in winter and cooler in summer: to the west, 370 meters (1,200 feet) above sea level, we find Lake Idro, while to the north-west we find Lake Tenno, at 570 meters (1,900 feet), and Lake Ledro, at 655 meters (2,150 feet). 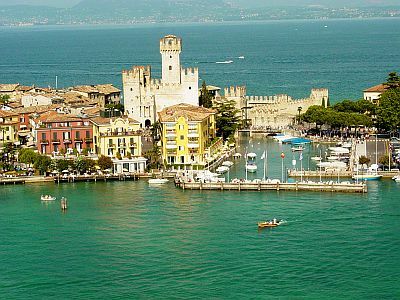 The best times to visit Lake Garda are spring and early summer, in particular from mid-April to mid-June. September, too, is a good month. However, you have to take into account some rainy days in both periods. Summer, which is the best time for a beach holiday, can be very hot to visit the different towns and for excursions, even though at certain times the temperatures are acceptable, especially in June. In summer and in May, thunderstorms in the afternoon or in the evening are to be taken into account.